Jongbel’s Video Search solution can instantly detect and locate the presence of a single video frame or video fragment in hundreds of hours of video materials. The search engine works with any video resolution, frame rate, video compression and container. The video search engine can detect and locate similar frames and video fragments with reasonable content deviation, caused by different resolution, video compression, bit rate and frame rate of the video content. It is based on revolutionary video fingerprint technology. The video fingerprint is automatically extracted from the media file. The solution implies a group of sensitive visual features extraction and fast search algorithms. It is possible to search and detect video frames or video fragments which are similar. The video content is taking 80% of the entire Internet Traffic worldwide. Hundreds of thousands of hours of video content is created every day and the speed with which digital video is being generated is constantly increasing. Almost every digital media company has to deal with huge amounts of video assets, by sorting, tagging and meta data insertion, which would allow later searches in the processed media. Using content-based video search engine it is now possible to search for similar scenes or shots, which are not sorted or tagged, relying on the visual information only. Jongbel’s content-based video search engine takes a revolutionary approach. 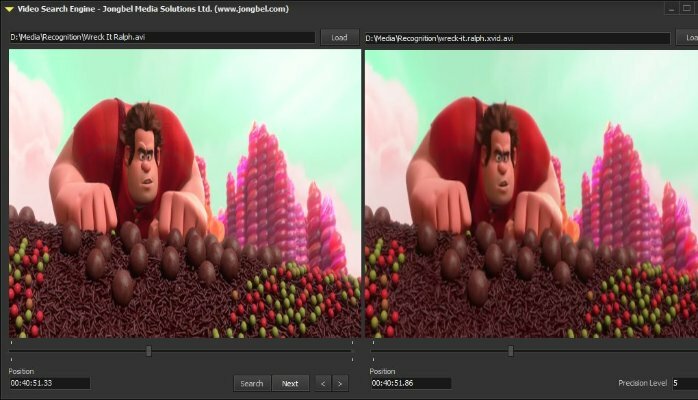 It allows fast searching in video media files based on the actual video content. The search engine can instantly locate two similar video frames or video fragments in hundreds of hours of video materials. Your media content will be better protected!